Claudey Belle Hester was a student at the Ray City School in 1920. She was born about 1906, a daughter of Annie L. Jolly and Luther Hester. Her father died about 1909 and she, her brother and mother went to live with her grandparents, Julia and Colwell C. Jolly. Her grandparents rented a home on Charles Street in Alapaha, GA. where her grandfather worked at a sawmill. Her mother re-married in 1913 to John S. Cone, and Claudie went with her mother to live on her step-father’s farm near Ray City, GA.
At age 14, Claudie wrote an essay about an Easter egg hunt at Ray City, and submitted it to the Progressive Farmer for publication. 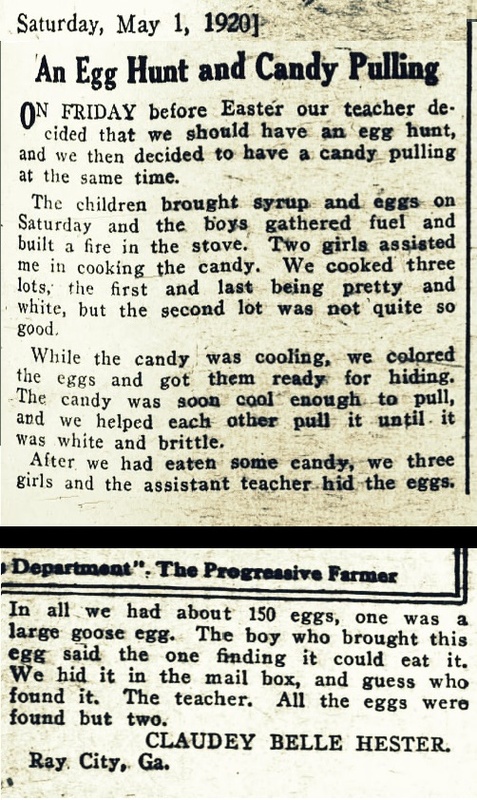 , Claudie Belle Hester’s 1920 essay about Easter at the Ray City, GA school was published in the Progressive Farmer. On Friday before Easter our teacher decided that we should have an egg hunt, and we then decided to have a candy pulling at the same time. The children brought syrup and eggs on Saturday and the boys gathered fuel and built a fire in the stove. Two girls assisted me in cooking the candy. We cooked three lots, the first and last being pretty and white, but the second lot was not quite so good. While the candy was cooling, we colored the eggs and got them ready for hiding. The candy was soon cool enough to pull, and we helped each other pull it until it was white and brittle. After we had eaten some candy, we three girls and the assistant teacher hid the eggs. In all we had about 150 eggs, one was a large goose egg. The boy who brought this egg said the one finding it could eat it. We hid it in the mailbox, and guess who found it. The teacher. All the eggs were found but two.